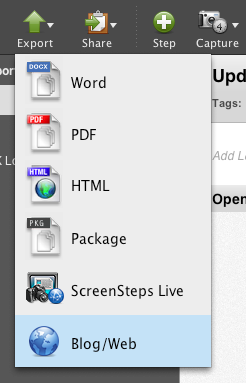 Now that you have installed and configured the Movable Type plugin you can configure ScreenSteps. 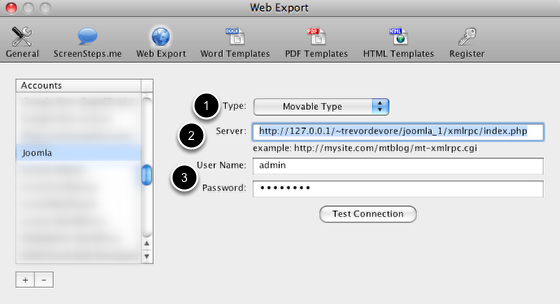 In the Preferences > Web Export pane create a new account using the Movable Type type (1). For the server you should use the url to your joomla installation followed by /xmlrpc/index.php (2). For the user name and password use an account that has permission to publish content on Joomla (3). 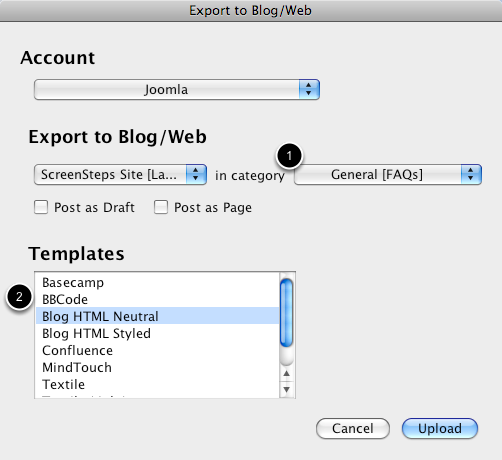 Now that you have configured an account you can export any ScreenSteps lesson to your Joomla account. Just select Export > Blog/Web. In the export dialog you can choose a category (1) to post the lesson to. You can also choose a template that can be used for formatting the lesson (2). Blog HTML Neutral is a good template to use as it will cause your lesson to inherit the look of your Joomla site. After posting the lesson it will appear in your Joomla site. 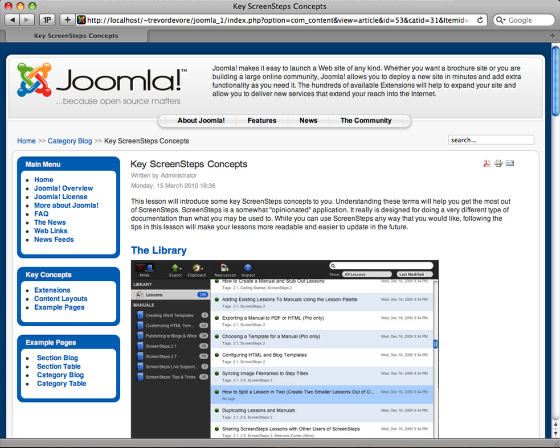 I have been wanting Joomla integration for some time and was about to develop a component myself. I received an error the first couple times uploading, but it finally worked. Rock Solid! Thanks for researching this and getting it to work! I went through the tutorial and set up the joomla integration and it worked like a charm. Any idea if the MovableType plugin will get upgraded for Joomla 1.7? This process no longer works. @River: Sorry, I don't. You would need to ask the person who wrote the plugin. Sorry, I accidentally click the link to "no longer receive emails" I'm posting this so that I can get emails again. Silly Me. @River Media, were you able to get this working completely for 1.6? @TJ - Have you set a default category for the plugin as described in this lesson? @TJ - Yes, on two separate websites. The only way I was able to get around this error was to recreate the entire lesson. Other than that, ScreenSteps and this process have been great! Let me also note, I'm sure that the error I encountered has nothing to do with ScreenSteps, but rather Joomla and this plugin. @River Media - I was troubleshooting a similar file type error with someone else the other day and the issue occurred when images had an extra "." before the file extension (e.g. file-name..png). This would happen if the step title ended with a "." and step images were being named after step titles. I've changed the naming routine in ScreenSteps in the next update (available soon) so that periods are stripped from the end of step titles when generating image filenames. @Trevor - Thanks for the update! You guys are all over this. The only thing better than a great product is a great product with great support! The one shown above worked on other sites, but this one just wouldn't take it. If you're having trouble try the expanded version.